Having friends visit us here is such a great way to reconnect with London. Being able to show someone the ins and outs of this city reminds me of all the places I’ve discovered in my time here so far. I guess you could say it makes London feel a bit more like home. But alas, now it’s time to get back to my real life, which means everyday dinners at home with only the occasional meal out or pint at a pub – not the barrage of places we hit up over the weekend: Tom’s Kitchen, Opera Tavern, The Booking Office, Thomas Cubitt, and even high tea at Fortnum & Mason. Luckily all of these experiences will play a role in what I cook up at home in my future posts. But for today it’s time to get back to basics, stop spending money, and making the most of leftovers! Sometimes the whole reason I spend a Sunday (or any other day) making a roast or braised dish is for the leftovers. Using slow-cooking scraps will add depth and transform your weeknight meals. Plus this is a great way to stretch your weekly grocery budget, using every last bit of your amazing meals. Are you sick of lamb yet? I swear I’ll change up my go-to protein soon. But these leftovers are so worth roasting up a leg or braising up some shanks. You just can’t get the same flavor from a “30 Minute” meal. I created this first recipe after a Sunday Roast leg of lamb. For the lamb, I simply rubbed it with garlic, rosemary, and dijon mustard and roasted it on a bed of potatoes and red onions until the internal temperature read 150˚F. There were four of us for dinner and I had made a whole leg, so there were lots of leftovers to use up. 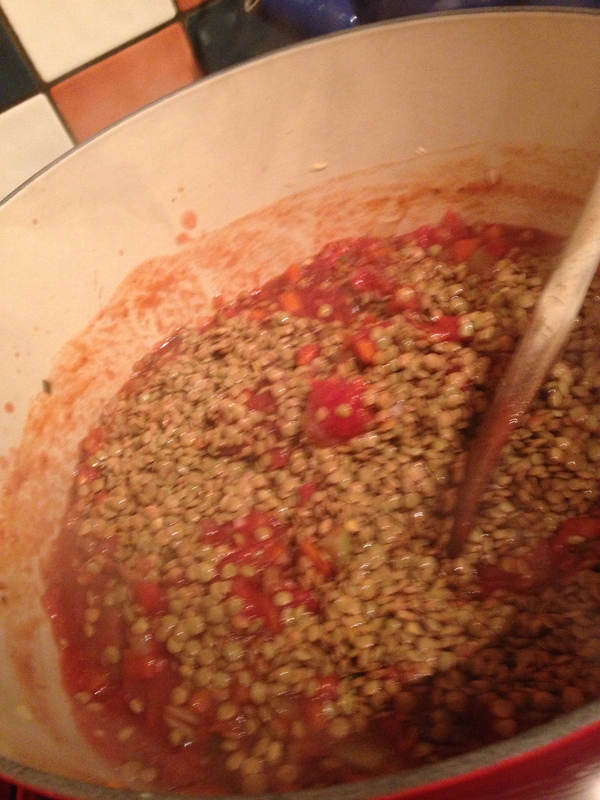 After cubing up the lamb, I began a simple lentil soup base. Start with a mirepoix (mixture of diced carrots, onions, and celery), add red wine, then diced tomatoes in their juice and the lentils. 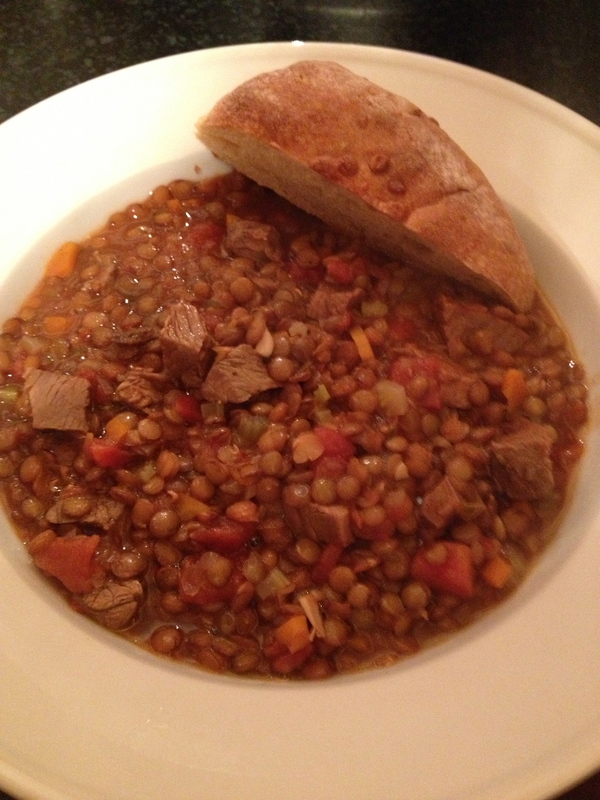 Add some broth and you already have a pretty delicious lentil soup. But let’s go further… we are trying to use up leftovers after all. 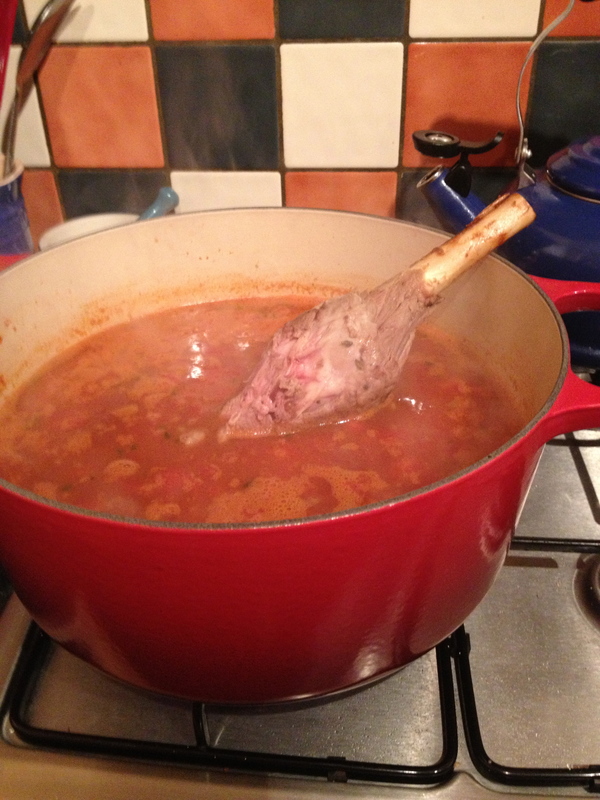 Next I add my secret weapon to give a huge flavor boost to the soup: the lamb bone. In theory, you would have a pot big enough or a bone small enough that you could submerge it entirely. But alas, we’ll use the leg as more of a spoon. Whatever. Make it work. 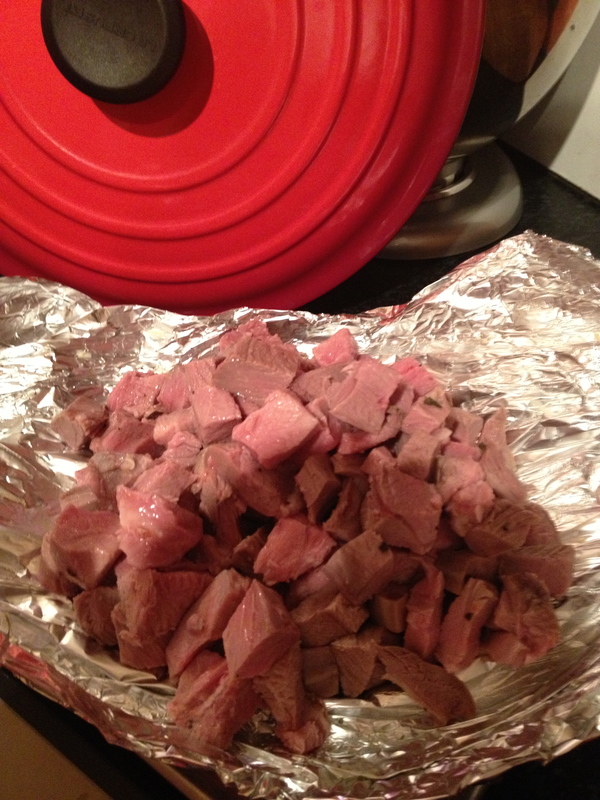 Once the soup has simmered for 30 minutes, remove the bone and add in the diced meat. Continue to cook for 15 more minutes being careful not to boil, as this will make the meat tough. Heat a large Dutch oven over medium heat. Add olive oil. Chop the onion, carrot, and celery into a small dice and add to the pan. Mince the garlic and stir into the softened vegetables. Salt and pepper the mixture and add the wine to deglaze. Once the wine is reduced add the tomatoes in their juices. 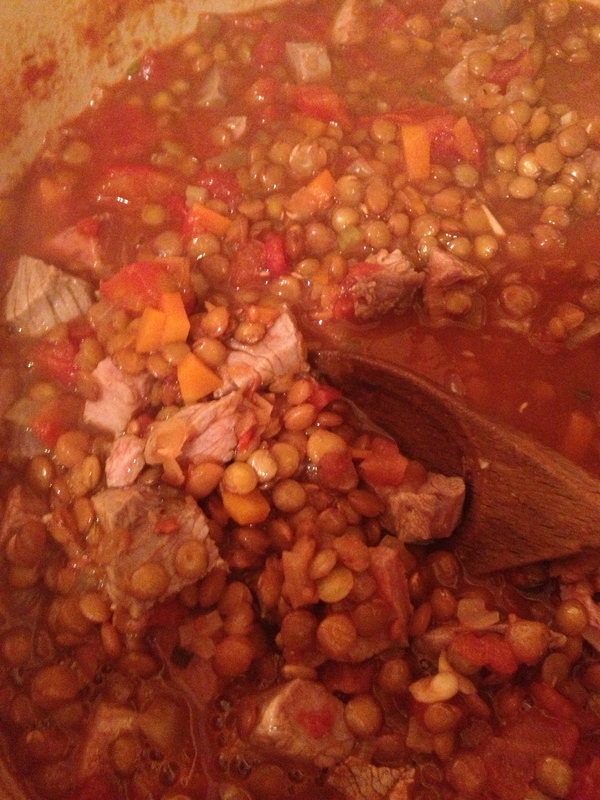 Stir in the lentils and the broth. Bring to a boil. Add the lamb bone, reduce to a simmer, and cook, covered for 30 minutes. Remove the lamb bone. Add the diced lamb and simmer for 15 more minutes. Be careful not to let the soup boil, as it will make the meat tough. Okay, this second dish is a bit of a cheat – it’s just so simple! I had a decent amount of my braising sauce leftover from my Valentine’s Day lamb shanks, so I picked up some ground lamb, sautéed it, then simmered with the sauce. You could always use ground beef or, even better, if you had a leftover shank, shred the meat and make this more of a ragu. 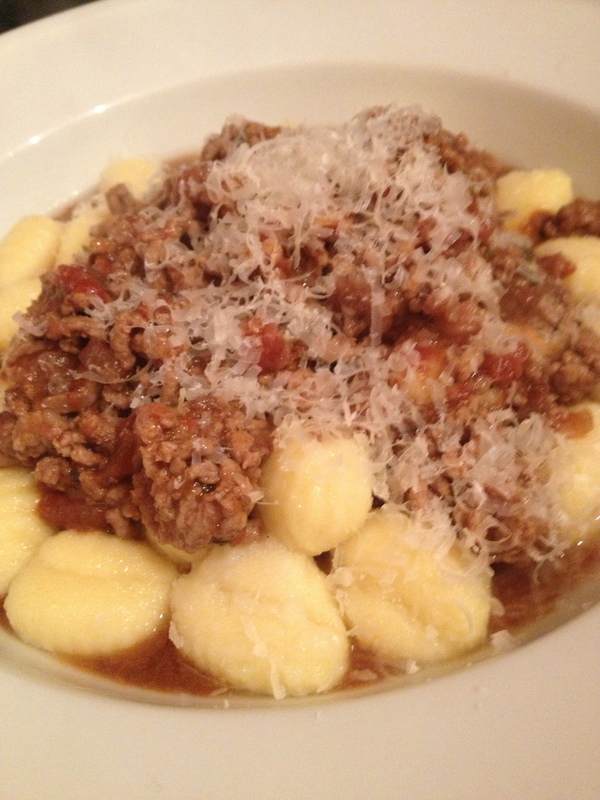 I served this over some freshly made gnocchi for a quick dinner that tastes like it took hours.